A good quality suit will not require frequent cleaning. Wool will naturally shed dirt when left to hang and this can be helped by frequent brushing. Dry cleaning and pressing can damage the complex three dimensional nature of a good suit. We can recommend excellent London based specialist cleaning services for bespoke suits. Try not to wear your suit every day. The fibres will recover with rest, and any creases will drop out. 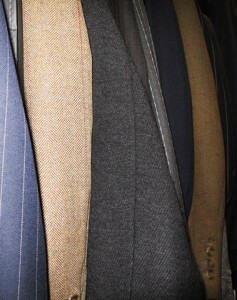 When hanging the suit use a good quality wooden hanger with sufficiently broad shoulders to support your jacket. The hanger you got with your Graham Browne suit is especially designed to support the shoulders of your suit whilst it hangs. Trousers can be hung on a cross bar or from a hanger with clips at the cuff end. Using these will allow the wait of the waist band to gently pull any creases out of the fabric. Before hanging be sure to remove all items from your suit and trouser pockets, and your belt, if used. This is the ideal time to brush the suit. Do this by holding it at the collar and brushing downwards, being careful not to snag any buttons. It is advisable to place a moth strip in your wardrobe. When sitting gently lift trousers at the knee. Good quality cloths will resist stretching, but this will greatly reduce the risk of having a suit with baggy knees. If removing the jacket at the office then hang it on a hanger. Avoid placing it on the back of your chair where you will be leaning back on the lapels.